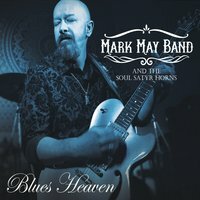 I just received the newest release (May 20, 2016), Blues Heaven, from Mark May and it's quite entertaining. Opening with Boom Boom, comes out kicking and with his guitar screaming. With a cool bass riff by Tim Keefe and a stiff snare drum rhythm, this track is off and running. May handles lead guitar and vocal duties. With it's soaring guitar lead and backing horn work by Ted "Teddy Boom" Basinger on trombone, John "Johnny B" Bonham on trumpet and Joe "Smokin' Joe" Reasoner on sax, this track is a hot opener. Sassy blues number, Money, sets up really nicely with solid bass line, supporting horns and and tight drums giving May space to lay out some really grinding guitar solo lines. Very nice! Two stepper, She's A Keeper, has country rock styling blended with a Louisiana flavor. Greg Martin slips in with some real nice slide work warming up the track. Title track, Blues Heaven is a simple ballad with a sweet melody. Matt Mees has the drums on this track and John Popovich on B3 adds nice texture. Some of May's nicest vocals on the release are on this track blending nicely with sax work by Eric Demmer. One of my favorite tracks on the release is Put Down That Poison with Ed Durante on rhythm guitar and Steve Krase on harp. May gives his picking a little country flair and Reasoner adds some really rich bari sax worh making this track a real standout. Shuffle track, Leaving Houston, has a smooth groove with May really settling on on vocal and guitar. Low octave baritone guitar work punched by the horn section is particularly effective on this track. Very nice! Boomerang has a straight line rhythm with an underlying funk thanks to May's guitar work and that of the horns. Trumpet work by Bonham gives the track a distinct Spanish flavor and May's wrapping guitar is quite nice! I'm Her Fool is a straight up blues rocker with some pretty cool lead slide by May. Gary Jorgenson is solid on drums and Steve Krase steps up the ante with flavorful harp work. Breaking into a gospel revival tempo, the track runs hard giving Popovich and Krase the space to show the heat. Gulf Coast Woman has a heaving driving bass line and May steps up the guitar lead with just a touch of Billy G. style. Funky horn track, All I Ever Do develops a real nice groove with funky horn work by Basinger, Bonham and Reasoner and a nice bass line from Keefe. With a super dance beat and fluid guitar runs by Hadden Sayers, this is a real cool track. Shuffle track, Garden of Truth, has solid radio appeal and a nice hook. Eric Demmer is back with a hot sax solo and May's guitar lead is crisp and clean. Kind of Girl is a real cool track with slick lead and slide guitar work by May and a funky bass line. Certainly one of my favorites on the release. Wrapping the release is Almost Like Suicide, a light funky bluesy track with a modern vocal delivery style. Mees is back on drums on this track and Popovich's piano work is really nice. May lays down some Spanish influenced guitar riffs making this a real nice closer for a solid release.